It's from CANNON... so it must be good. Errr. Probably. Cannon briefly burned bright in the history of cinema by - almost overnight - becoming a big player. And then vanishing just as quickly in a cloud of debt and dodgy accounting practices. Cannon's business model relied on producing a lot of movies very cheaply and hoping that some of them would - mysteriously - become a big enough hit that it would offset all the small losses incurred by the rest of the slate. 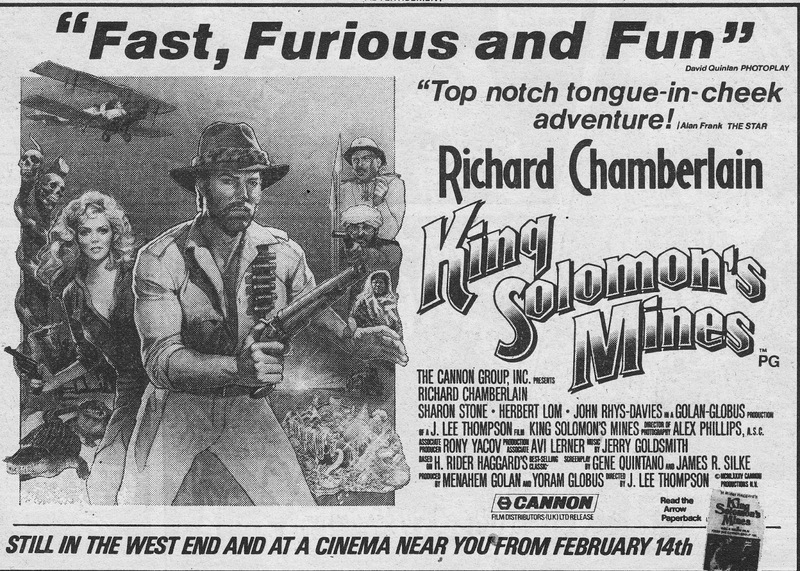 Of course, the film business is a legendary way of loosing lots of money and Cannon were no exception. Their legacy is actually pretty substantial and - although scattered to the four winds by bankruptcy - it's still possible to stumble across one of their flicks on DVD, released under the auspices of another studio or video label. Indeed, just yesterday I succumbed to a charity shop copy of the much pilloried (and - I suspect - with very good reason) Cannon Stallone vehicle OVER THE TOP, released as an MGM (no strangers to financial woe and eccentric business practices themselves) disc. Amongst their most famous flicks are the (really not that bad in the circumstances) MASTERS OF THE UNIVERSE movie and (the really bad in any circumstances) SUPERMAN IV: THE QUEST FOR PEACE. They also churned-out the DEATH WISH sequels, if you like that kind of thing. In Britain they also became a major player in the screening business by acquiring the faltering CLASSIC chain, during the early eighties cinema implosion, from cash-strapped ACC (Associated Communications Corporation, one time parent of ATV/ ITC). Cannon subsequently snaffled up the ABC chain, formally owned by EMI. The cinemas were supposed to give Cannon control of their own means of distribution by booking their own movies onto their own screens. However, the reality of much of Cannon's fare was that - if it was going to attract an audience at all - it was going to through video rental. Their films - for the most part - were' the sort of films that were going to draw the great British public to the big screen in any significant numbers. The ABC deal also gave Cannon ownership of Elstree Studios, the home of the original STAR WARS and INDIANA JONES trilogies as well as a host of other famous British films and TV shows. The studio was supposed to give Cannon a cheap in-house production facility for their b-movie flicks but it was an odd acquisition as the company tended to shoot most of their productions overseas where costs and overheads were significantly less. Cannon's complicated system of international pre-sales successfully kept the illusion of solvency and success but, over time, buyers became were wary of their unsophisticated fare and the company resorted to some shady accounting practices to keep the wolf from the door. Predictably, the whole house of cards was eventually rumbled and the group collapsed with much of their assets, including the British cinema chain, sold to MGM. That's a long-winded way of introducing this half-page ad (from EAGLE 15 February 1986) for Cannon's INDIANA JONES knock-off KING SOLOMON'S MINES. I've never seen it but the cast (Chamberlain! Stone! Lom! The rotund bloke from SLIDERS aka The Kingpin!) is certainly intriguing and I have a soft spot of cheesy fare (are THE ASYLUM the modern Cannon?) where good intentions outweigh ability and budget. UPDATE: After posting this last week, I figured it might actually be a good idea to see (for the first time) the movie itself. Thanks to the joys of Amazon's Prime service I had a copy in time for last weekend. I'm pleased to report that - except for a couple of ropey process shots and a rubbish giant spider - this is a perfectly watchable romp very much in the Indy tradition. The producers obviously maxed out their (presumably not bloated) budget by getting top bang for their buck by shooting in Zimbabwe. The location work is top-notch and benefits from a vast cast of extras (they were probably cheap). The 'darkest Africa' cliches pile up thick and fast (cannibals with a giant cooking pot) but the pulp-like nature of the romp keeps it the right side of dodgy. The cast also make the best of the situation and whilst Chamberlin is no Harrison Ford, he doesn't embarrass himself either. I'd completely forgotten there was a follow-up, ALLAN QUATERMAIN AND THE LOST CITY OF GOLD (shot back-to-back) but I liked the first one enough to order the second disc. For some reason, Wikipedia thinks both DVDs are out-of-print but it was easy enough to find cheap brand-new copies online.